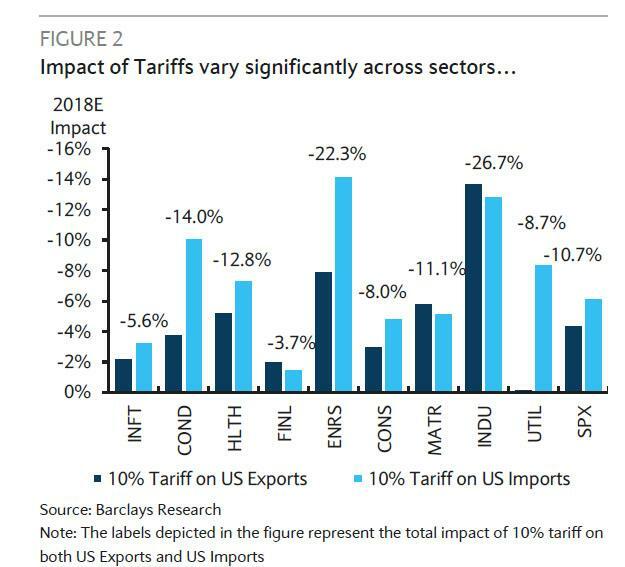 One month ago, when previewing the potential fallout from an "all out" global trade war, which for simplicity's sake many have equated with an across-the-board 10% tariff on all US imports and exports, we presented an analysis from Barclays, according to which the hit to 2018 EPS for S&P 500 companies would be ~11% and, thus, "completely offset the positive fiscal stimulus from tax reform." Since then, trade tensions have only escalated at an alarming pace. In context, the US has already imposed tariffs on $79 billion of US imports and proposed tariffs on an additional $702 billion, with the combined $781 billion in targeted goods representing 27% of total US imports. 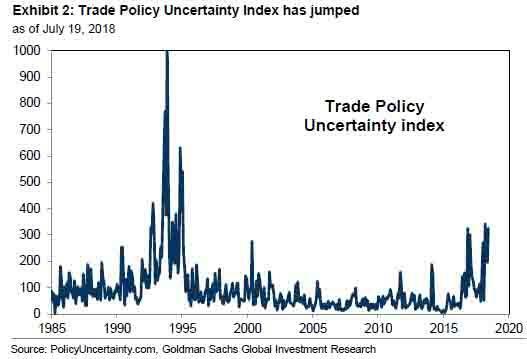 Reflecting this escalation in trade tensions, the Trade Policy Uncertainty Index recently notched its highest reading since 1994 around the time of NAFTA’s inception. 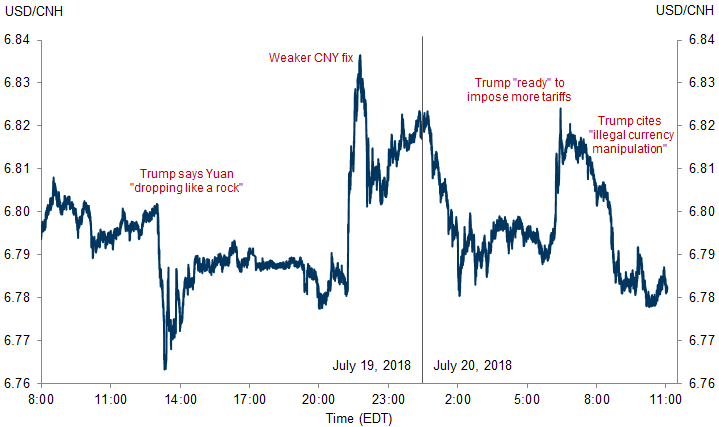 ... and eventually prompted Trump to also enter the fray, when he first complained about the Yuan "dropping like a rock" on a CNBC interview (coupled with some not so veiled suggestions against the Fed rate hiking ambitions), followed by vows to impose more tariffs and complaints about "illegal currency manipulation", which have resulted in a rollercoaster move in the Yuan and, inversely, the dollar, and prompted Goldman to write that "trade war is evolving into currency war." 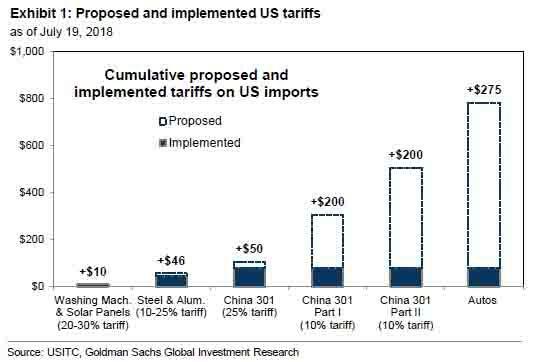 And speaking of Goldman, overnight the bank's chief equity strategist came out with a report that seeks to mitigate some of the concerns what a global trade war would mean for S&P revenues and earnings. Specifically, Kostin writes that "Tariffs pose a risk to S&P 500 earnings through two channels: (1) lower revenues from exports and (2) higher input costs and weaker margins." The tariff impact on S&P 500 EPS through lower revenues is minimal. S&P 500 firms derive just 2% of aggregate sales explicitly from China. Even a global trade war where every country imposes a 5% tariff on all trading partners would have a muted revenue impact. Our economists estimate the demand-side effects of such a scenario would reduce US GDP by roughly 20 bp and world GDP by 10 bp. This scenario would translate to a 1% reduction in 2019 S&P 500 EPS (from $170 to $169), given our EPS model’s sensitivity to GDP growth. Tariffs pose a larger threat to S&P 500 EPS through lower margins. We consider adverse scenarios in which tariffs are placed on all imports from China or globally. For all US industry, roughly 15% of cost of goods sold (COGS) is imported. We assume that S&P 500 companies, which are more global in nature and have more complex supply chains, import roughly 30% of COGS. This is consistent with the 29% of S&P 500 sales is generated outside the US. Imports from China comprise 18% of total US imports. What is the quantitative impact: here Goldman's assessment is roughly in line with that of Barclays. Conservatively assuming no substitution to other suppliers or pass-through of costs, and no boost to domestic revenues or change in economic activity, a 10% tariff on all imports from China would lower our 2019 S&P 500 EPS estimate by 3% to $165. If tensions spread and a 10% tariff were implemented on all US imports (highest rate since 1940s) our EPS estimate would fall by 15% to $145. No clear relationship exists between reliance on imports from China and recent industry performance. Among at-risk industries, Computer & Electronic Products, which include Semiconductors, have lagged the Russell 3000, while Electrical Equipment stocks have outperformed. As our Tech Hardware and Retail analysts have noted, trade headlines may overstate fundamental risk, as companies have many tools at their disposal to minimize margin pressures. Some firms may be able to switch to other suppliers, while others will pass through costs. A basket of TMT stocks with high imported COGS has also shrugged off the risk from tariffs, matching the broader Info Tech sector’s 12% rally since March. Kostin cautions that this may be a mistake, however not due to the quantitative aspects of the trade war, namely the downstream impact of tariffs, but the qualitative, and thus much more ambiguous, implications. Geopolitical tension can manifest itself in ways beyond tariffs. As precedent, China publicly encouraged consumer boycotts that led to a plunge in Japanese auto sales (in 2012) and South Korean products (in 2017). Last week, China issued a temporary injunction on some of Micron’s (MU) chip sales due to alleged patent infringement. The stock fell by 6%. MU downplayed the impact on sales and the share price has since recovered. Our base case forecast is that S&P 500 rises 2% to 2850 at year-end 2018 and by 7% to 3000 at year-end 2019. In the event of a severe global trade war, our 2019 EPS forecast could equal $145 (a 10% decline from $159 in 2018) and the forward P/E multiple could contract by 10% to 15x, dragging S&P 500 to 2200 by year-end 2018. The intensifying trade war has so far not seen a bear market. If this indicates the markets are correctly pricing in a Great Depression-like crisis not occurring, we would agree that there is little likelihood of a repeat of the Great Depression. However, the possibility of the trade war leading to a global recession is not so small. Perhaps share prices are firm because the uncertainties are too great for risks to be priced in appropriately. 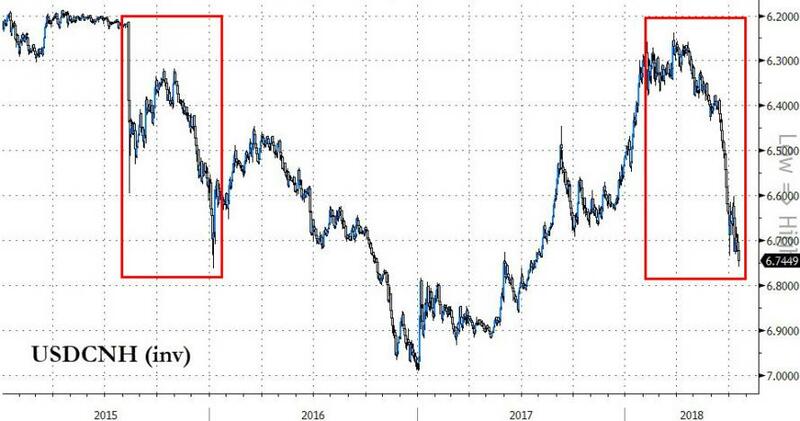 One cause for concern is that renewed monetary easing by the world’s central banks might rekindle a fear of competitive currency devaluations, as it did in 2015 and early 2016. While monetary policy has become markedly less effective, as nominal interest rates are very low and the natural rate of interest continues to flounder, currency depreciation is still a tried-and-true channel for transmitting monetary policy. Globally, this might be a zero-sum game. For this reason, monetary easing itself poses a risk of destabilising the global financial markets by rekindling memories of currency wars. The bank's conclusion: "All things considered, we do not think the outlook is very bright."